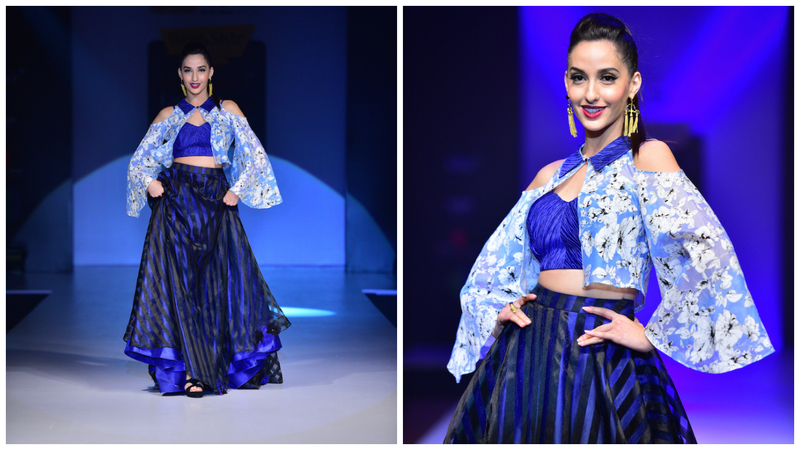 Interview: Nora Fatehi - Show Stopper for Designer Shazia Naik at Bangalore Fashion Week | Unkrate | Creating Experiences. Nora Fatehi is a multi-talented young name in Indian Entertainment Industry. She is an actor, a dancer and a model. Born in Canada, she came to Mumbai to make her childhood dream a reality - to become an actress. She believes in the philosophy 'Only hard work, not good looks will take you very far in the industry'. Nora made her Bollywood debut with 'Roar: Tigers of Sunderban'. Though the film did not fare well at the box office, her talent was noticed in Bollywood. After that, Nora made special appearances in popular movies like Kick and Bahubali. She has also done a song Emraan Hashmi starrer Mr. X.
as a Show Stopper for dubutant designer Shazia Naik at Bangalore fashion Week. Nora Fatehi in an interview with Suman Prasad, spoke in length about her career, experience of being a show stopper at Bangalore Fashion Week, about her participation in Jhalak Dikhhla Jaa and many other interesting things. My experience has been a roller coaster so far. It has been unexpected, spontaneous and fun. I have to work extremely hard for every job I do whether it’s acting, dancing or modelling. Primarily for acting because i didn’t know how to speak Hindi in an industry where Hindi is a necessity. I had to work extremely hard and sacrifice a lot to learn Hindi in a very short time. Dancing is also tough for me as I am not a trained dancer, I have learn to dance of my own which comes with a lot of limitations. In the modelling world I have struggled because of my height. Even with all these limitations I still push and never give up. Persistence and dedication has helped me reach where I am today. I always wanted to be an entertainer, actor not a model. When i got an offer from an agency in Canada for a modelling contract, I accepted it because you have to start somewhere and I felt this would be the best way to start. Post taking up this offer, I received another offer from an Indian agency for a 3 month contract which I accepted without thinking twice. This was a time when I was trying to find ways to enter the entertainment industry. My biggest influencers as i was growing up were Madhuri Dixit, Helen, Tabu and Didem the belly dancer. On being the Show Stopper for Shazia Naik at Bangalore Fashion Week. I feel honoured to be her showstopper. 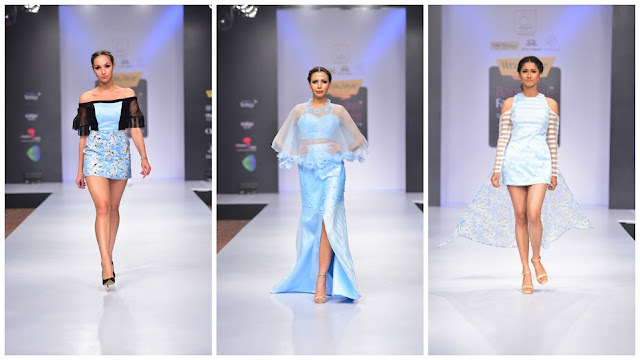 I love Shazia’s collection, they are so stylish and pretty. This is my taste in clothes and I love how her collection is so girly and sophisticated. I was very excited when I received the call and in seconds said yes. I don’t consider myself a model as i don’t have traits of a model. Also, my work does not consist of only modelling work. I have not experienced ramp life and photo shoot life like models do. I have done ads & commercials and I believe this is more of an actor’s world. Hence, people perceive that it is easy and you can get going only by the good looks. This is incorrect. It is an extremely difficult industry, the competition is unbelievable and good looks will get you know where without talent and passion. My style is girly and pretty. I love lace and bling. I enjoy wearing glamorous outfits and high waisted skirts with crop tops. I love blingy lehengas and shades of pink. I feel beauty is in the eye of the beholder. Everyone’s perception of beauty is different. I believe when someone’s personality is nice they already are beautiful. I have many dream projects one of them is Jhalak Dikhhla Jaa which by the grace of god I am doing now. I would also love to do a big banner commercial film in future. I have always been obsessed with Indian fashion. I come from a background and culture where Indian fashion has always been a part of our lives especially during weddings. I have no expectation at all, I am performing from my heart and I am enjoying every moment of this. This is an amazing opportunity and i know many people would die to be a part of Jhalak. Hence, I believe whatever is meant for me is meant for me. In the meanwhile, I am giving my heart and soul to every act and giving my 100% during rehearsals. I am pushing myself every day to learn new things and give variety to the audience. I take every performance very seriously because I respect the art of dance. I rate myself a 6 out of 10 but with Jhalak I will learn more and improve every day.